Siebert Realty - Over 400 Fully Furnished Vacation Rentals! Most Secluded Beaches in the U.S.
And for those times when you want to get away from the hustle and bustle of the resort area, many venture to the southern portion of Virginia Beach, where there are miles of picturesque horse farms, quaint country stores, and fields of fresh fruit and vegetables. 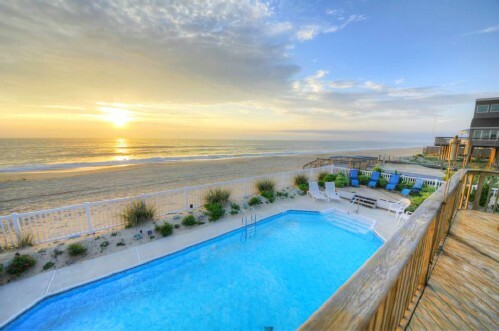 People also enjoy the tranquil coastal community of Sandbridge Beach located just 20 minutes from the resort area. Often referred to as "The Outer Banks of Virginia", Sandbridge is a secluded five mile beach... just a few blocks wide, with the Atlantic Ocean on one side and the calm Back Bay waters on the other. Vacationers and locals alike love this non-commercial family-friendly beach that offers over 600 available rental homes, as well as two large condo complexes - perfect accommodations for family vacations in a more low-key setting. While at Sandbridge, you should make a point to visit the Back Bay National Wildlife Refuge, which borders the southern end of Sandbridge. This remote refuge is known as one of the east coast’s most beautiful, unspoiled destinations. Visitors can observe wildlife in their natural habitats along various hike/bike trails, or can travel through the refuge via an electric tram to False Cape State Park, featuring 7,700 gorgeous acres of beach, dunes, woodland, and marsh. The refuge is a "must see" whether you live or vacation in Virginia Beach. The abundant wildlife that inhabits the refuge includes wild horses, a variety of waterfowl, fox, deer, and more! We highly recommend using Siebert Realty which is the oldest and largest vacation rental company in Virginia and they've been in business since 1962. Team Siebert are experienced REALTORS and also proud members of VRMA (Vacation Rental Managers Assocation). Customer service is their top priority and they manage over 400 fully furnished beach home and condo rentals (2-13 bedrooms / Sleeping 6-30 people) that come fully equipped with all the comforts of home! Siebert Realty offers a wide range of rentals... from simple basic beach cottages to massive luxury mansions with all the bells and whistles! Many rentals even have huge Media Theater Rooms, Indoor and Outdoor Pools, Hot Tubs, Elevators, Gourmet Kitchens, Boats and Boat Docks, and some are also Pet Friendly. Whether it be a summer vacation, family holiday reunion over Easter, Thanksgiving, Christmas or New Year's, or simply a romantic weekend to getaway from it all, there's always a good reason to visit Sandbridge. Even "the guys" can grab some bonding time with a golf getaway or perhaps to watch "the big game" or go on a deep sea fishing charter. And ladies, Siebert's rentals and the surrounding shops, salons, and spas would make for a fun "Girlfriend's Weekend". Siebert even has large rental homes that provide the perfect setting for an unforgettable wedding ceremony along the shore. You can check availability, view interior photos and floorplans, order a free rental brochure, and even BOOK and PAY ONLINE at: www.siebert-realty.com. MC / VISA Accepted.